At this time of the year, many companies find the need to maintain open access to dock doors and warehouses without letting heat and other environmental controls escape into the cold. The obvious solution has been to install vinyl strip doors, which allow easy access to foot and lift truck traffic while they also keep climate-controlled air in – and cold air out. We’ve created a guide to specifying vinyl strip doors to help you understand what types of strip materials to use, how much is needed to cover a particular opening, and which mounting system might work best for you. This table explains at a glance how many vinyl strips of a size and overlap percentage are needed to adequately cover an opening from 3′ to 19′ wide (regardless of height). To use it, measure your opening, then decide the kind of strip material and overlap you want and read to the column that matches for the number of needed strips. For instance, an 8′ wide door using 6″ strips with 66% overlap needs 24 strips to adequately seal and cover the area. The size and overlap of stripping speaks to the kind of traffic you expect. The more overlap, the tighter the seal, but the more difficult to push through, so larger strips with 100% overlap aren’t recommended for pedestrian traffic (unless you want to give everyone who goes through a decent workout). There are many types of strip materials, some useful for insect or light control and other specialized applications like freezers and coolers. Most of the time, general usage strips will fit your application. Standard Smooth is formulated for indoor/outdoor applications with a temperature range from -10°F to 150°F. The most versatile strip door material. It will not discolor in sunlight. Ribbed Curtains are constructed with offset ribbed material that reduces scratching and abrasions from heavy use, lasts longer, and provides a stronger seal than smooth material. Use ribbed material when you need to maintain visibility between the two sides of the opening. 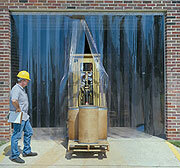 They’re good for instances where lift truck traffic is present and visibility is vital for maximum safety. 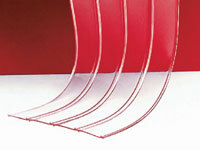 Scratch-Guard stripping features superior scratch resistance. Its non-stick surface reduces static-electricity while it provides easier, safer entry. It affords less visibility than standard strips. The MaxBullet system is one of the easiest and most economical mounting systems on the market with 75% faster installation and 90% faster strip replacement times. Door strips simply push into place on the “bullets” and fit all sizes of door strips except those with 4″ width. The MaxBullet’s® unique bullet-shaped locking feature allows for easy strip snap-on/snap-off installation yet stays securely in place for heavy-duty daily use. Universal mounting hardware is recommended for the heaviest strip applications such as 16″ wide or strips which are particularly long in length. All mounting holes are pre-drilled and all fasteners except those needed to attach mounting hardware to existing building material are supplied. Universal mounting systems are available in your choice of aluminum or galvanized steel. Both are available in aluminum or galvanized steel to meet your application.